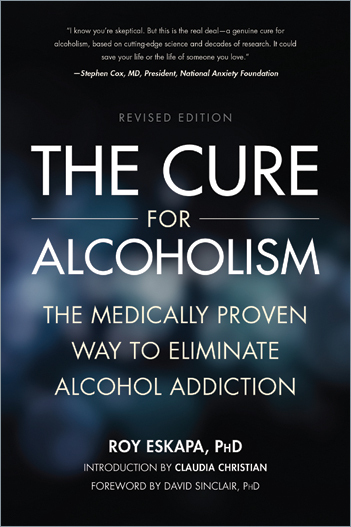 An introduction to the 5 steps of the Sinclair Method from the book "the Cure For Alcoholism" by Dr Roy Eskapa. This section is taken from “The Cure For Alcoholism” by Dr Roy Eskapa. STEP ONE – Understand and think about addiction in an entirely new way. STEP TWO – Check the severity of the problem and find out if you need help. STEP THREE – Work with your doctor to obtain a prescription for naltrexone or nalmefene (selincro). STEP FOUR – Learn about alcoholic beverage measures and keep a record of your drinking and craving as you begin your journey through de-addiction. Now you are taking naltrexone or nalmefene before drinking alcohol. You become de-addicted – your craving and drinking levels decline gradually. STEP FIVE – After three to four months – in some cases up to six months – you will be cured. Now your goal is to stay cured once you have completed the program.